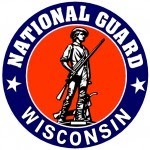 Yesterday I shared some of the Gold Star Families’ reactions to a few of the WI NG actions. I am assured by somebody who knows Major General Dunbar that he is sincere, and will pursue this matter. This is not going away. Stay tuned.